Today's preview is a doozy! It's the game's mass combat rules. This set of moves is from the point of view of the leader of the company, the general or the war-captain. It condenses minutes or an hour or more of action on the field into a couple of rolls and decisions. The goal of these moves is: 5 minutes later at the table, your war companies have met, struck, and forced each other into new positions in the world. Maybe one's won and one's lost, or maybe it'll take a couple more exchanges to come to that conclusion, but either way, one's winning and one's losing. There are new irrevocable decisions to make. There's a stuck-on move for PCs in the war company, but the view these moves take is that if you're a soldier, you're caught in the sweep of the battle. It develops beyond your ability to direct it. Oh and here's a departure: if your enemy war-captain is an NPC, the MC rolls dice! 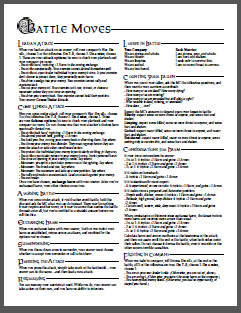 Ultimately, these rules will take up I dunno 20 pages in the game book. Here they are in 1 page. Do your best to work through them and I'm happy to answer questions about them as always. If you want to sign up for the playtest, please do: lumpley.com/index.php/awda. I'll release the playtest document this weekend, touch wood no jinx! What's the actual difference between the first list and the fifth list under considerations for harm? Outnumbering the fire versus being... Larger than them? Is this to cover like, fighting an army of giants of something (which would be physically larger than your men, rather than outnumbering them)? Warren: It takes the defense option "you defend yourself well" off the table. One thing that's been nagging me is, how do you get from numerical harm to "bloody, limping, gutted, butchered"? Is it 1-for-1, or something else? Jim: 1 for 1, exactly. For each 1 Harm you take, you cross off 1 line, starting from the top. Are shield bonuses (+1 harm, +1 armor) cumulative with horseback bonuses (+1 harm, + 1 armor)? I would think the former would be generally applicable to shield wall or footman single fighting. I was thinking that the shield bonus could be only +1 armor (no harm) with the caveat that it would have a special tag enabling its user to strike hard at +2 harm, or alternatively a 1ap tag, either ain some special circumstances, in order to reflect its offensive utility? Did you just say "MC rolls dice"? I may faint of shock. PF go "I did in fact faint"
Those battle moves seem pretty solid to me. Can't wait to playtest this stuff! I'm not sold on the MC rolling dice, if I'm honest. I am glad the MC has to roll dice. As for the rules, they look very solid. What I would like, perhaps, is a "cap" to the bonuses: instead of piling up +1 after +1, it would be nice to have a scale. Something that says you get +1 for this and this and that, but to have effectively a +2 you need something "more serious" - but I need to think how to explain this better. Something like: on horse +1 armor, shield +1 armor, being bigger +1 armor. But to have +2 armor you need near invulnerability, so charging on horse, shield wall on foot, and being reaaaaally huge. So if you're on horse and with shield it still just counts as +1. Anyway, that's just me blathering: I cannot wait to see the complete document! this and the other previews look really good! Hmm. I wonder whether these rules will see more play than AW's extended battle rules did. The fact that individual players no longer take much action within the frame might mean the rules see more use! I like that surrendering is an active battle option, in essence - leaves the possibility that you will simply be butchered if things do not go well and you didn't choose it. But it bothers me that there some combinations of choices on that list that I won't be able to make - "We strike back hard, and at the same time we surrender." Might come from the somewhat misguided notion of "if the rules allow it to go, then it goes, common sense be damned!" Andy, Warren: Take a little lie down. I think you'll probably be okay. Davide: The math on the accumulating +1s works out pretty well. I don't expect it to change, but of course playtesting will tell. DWeird: I expect them to see a lot more use, yeah. You can't really conduct a battle without them, like you can in Apocalypse World proper. You can strike back hard and then surrender. Why not? The exchange of harm is first, then the other options you choose. I can only say I am ready. I like that Harm and Armor modifiers stay the same throughout the battle. That makes what happens leading up to a battle seem very important—building defenses around your encampment through the night, luring a foe into a well-laid ambush, tricking an enemy general into splitting her forces. Question about "defend yourself well": is that +1 Armor for the rest of the battle, or the coming exchange (like "strike back hard")? Addison: Ah, yeah, just for the coming exchange. Good catch. Interesting side effect: it's easier to kill a particular person when you're the defender. Someone making the Lead the Attack move can declare that they're striking at a particular person. Someone making Come Under Attack move has the option to defend a person that's under attack. They also have an option of striking a particular person, but the attackers don't get a chance to specifically defend your target. "Your enemies cannot hold their position" - is this meant only to cut off the "hold the line" defensive option, or is it meant to require the enemy to choose a maneuver? If the former, then both choices should be worded the same. If the latter, then there should be a note somewhere on how that works with "you cut your enemy off", especially if they fail and only get to hold 1. Jeff, about targeting a particular enemy: It's true. I think it's okay, on the theory that if you really want to keep someone safe from harm, you won't include them in the attacking force. About holding position: Ah, yes, it's the former, it means they can't hold their line. Good catch. What determines if you are the attacker or defender? As a sidenote to the people who shiver at the thought of the MC rolling dice - if you've played AW and used the Harm move, you've already had the MC roll dice. You could think of the DA MC's battle move as simply an extended harm roll. The_Tim: If you both want to be the defender, there's no attack. If you both want to be the attacker, circumstance and the MC's judgment determine it. The MC might have you make a basic move or two, or might just ask you at what o'clock you intend to attack, and award it to whichever of you says the earlier time. So, I get the sense that the leader of the attacking or defending force is not harmed unless the opposing side strikes at that particular person, as an option chosen. Am I right? This implies NPC war-captains have a War stat. Do NPCs get a full compliment of stats now? Not sure if there's a quick explanation for it, but I'm kinda struggling with quantifying terms like "some hurt and shaken" and "many killed" in the "counting your fallen" move. How large a portion of an army is referred to by 'some' and 'many'? Also, are these moves meant to be used in sieges as well? I'd imagine so, given the "If it fights from a prepared and defensive position" move, but was wondering if there are other rules or considerations to take into account in such situations. Charles: Good question. The rules don't specify, except kind of obliquely. Go with, you're right. Nic: Nope! A company has a War stat, not its leader. It's like a gang's stats and tags in Apocalypse World. Brandon: The draft rules set those at 10% and 20%. These moves are meant to be used for the battles that happen during sieges, but not for the sieges themselves. I haven't made siege rules yet. "Do not change it during the battle, even if one side or the other suffers terrible casualties" Why isnt it possible to actualize ? More simple ? Difficult to quantify ? If there's a break in the battle, or a maneuver like "take up a new position", couldn't it be possible to do it ? Or is there some kind of skirmish move for the attackers ? Anyway, very good stuff. Seems like you read Sun Tzu Art of War and tried to apply it. Seb... I think it's intended that here, "battle" means one usage of the paired moves. So, just don't adjust harm and armor between the two moves, or in the middle of one, but once it's all resolved, check for casualties and recalculate then. Maybe? Seb, Alex: No, see the battle through its very final exchange, its very final pair of moves, before you count your fallen and recalculate your company's numbers. Seb's right. The reason for this is both to avoid bookkeeping in the middle of the action, and also to make sure that both companies take harm appropriately. Counting your fallen and reorganizing your company means breaking and resetting how much harm your company has suffered. If you do that in the middle of a battle, it messes up how harm accumulates. Nice work, I'm feeling scooped! And I was expecting to get scooped on this particular front by Adam/Sage. Also, am I right in thinking you've snuck some Swords without Master into this? When someone puts you in danger, through intention or accident, you have the right to ask them to pass you the dice. You can ask the person who passed the dice to describe the dangers you face or the MC to describe the options you have. As they describes the options, they become more remote, as they describe the dangers, they become more immediate. If you act on this information, you get +1 to your roll.